There may be at least half a million pieces of man-made junk orbiting this planet. Tiny pieces can travel around 10 kilometers per second, far faster than a bullet. The International Space Station has had to adjust its orbit just to avoid the stuff. People are rightfully concerned about what to do with all this orbital litter. Recently, a team of Chinese scientists published a paper about removing the debris with a space-based laser station. Specifically, they discussed how the orbit of such a station would impact its ability to remove the junk. But are we close to seeing such a system? Will it ever exist? The problem of space junk is real—the scientists point out that most concerning are the pebble-sized pieces of junk that space agencies aren’t tracking. These can cause lots of damage to an unprotected spacecraft. 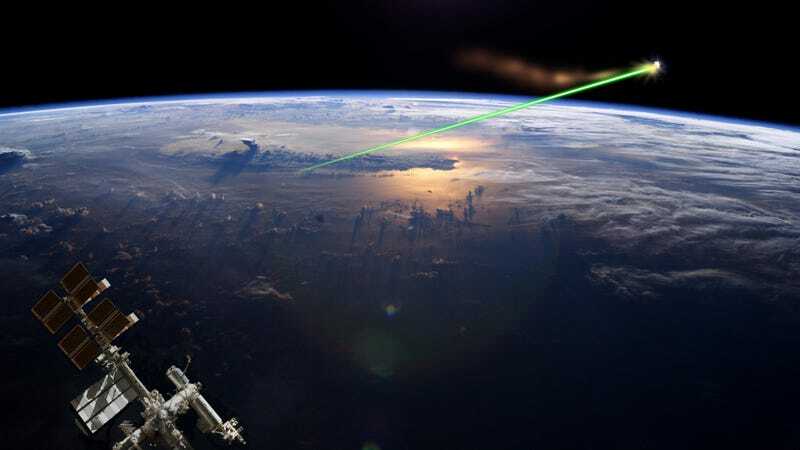 The Chinese researchers write that lasers serve as the most promising option to eliminate this debris, noting that Earth’s geography and the vast distance between ground and orbit make a land-based laser a limited solution. “Hence, it is necessary to study the basic principle and feasibility of space-based laser debris removal,” they write in the paper published in the journal Optik. This paper has lead to some press coverage—but the idea is not especially new. Scientists have been researching these solutions for many years, although one 2015 paper says there’s been a sort of recent renaissance for the idea of a junk-clearing space laser. That 2015 paper, published by Austrian researcher Manuel Schmitz and others in Acta Astronautica, explains that the debris isn’t really being blasted, as some coverage seems to imply. Instead, the laser would impart energy into the hunk of debris, causing it to fall out of orbit and burn up in the atmosphere or deflect out of the way of a spacecraft. The new paper in Optik consists solely of modeling, but really, it’s further experimentation that’s needed: “Only a broader campaign of experiments can verify the elaborate theoretical models, and create sufficient credibility and proof that the laser-ablative propulsion mechanism performs as expected when used with space debris targets,” says the 2015 paper. And what country is going to let another world power put such a laser in space? 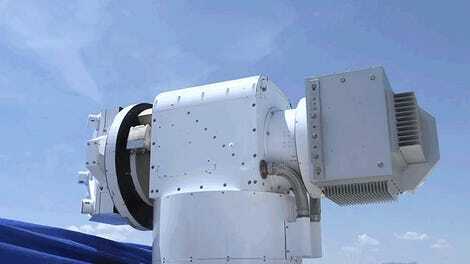 “It could be used for military,” Victor Apollonov, a physicist who studies high-powered lasers at the Russian Academy of Sciences’ General Physics Institute, told Gizmodo. “Due to that, it is questionable.” He noted that people have been speaking about the idea since the early 2000s. “I believe the first step should be some world-scale discussion about” deploying such a laser in space. So, yes, there are teams researching a space-based debris-removing laser. But whether countries will allow one another to actually deploy such an object is a question that has yet to be answered.